The streets on the barrier island of Mantoloking, N.J., are alive with construction activity on an unseasonably warm day in November of 2014. Heavy equipment is rolling and crawling. Hammers are pounding on lumber. Hard hats and safety vests dot the landscape. And the smell of asphalt and fresh lumber competes with the salty aroma of the ocean. Progress is under way, but it came at a price. The borough of Mantoloking was among the areas hardest hit by Hurricane Sandy in October of 2012. The powerful imagery was witnessed around the world as this post-tropical cyclone pounded the New Jersey coastline, leaving in its wake fatalities, stranded residents, mangled homes, crumbling infrastructure and felled telephone poles. The ocean met the bay in up to five breach areas, forcing first responders to navigate the town in boats. As the 2014 hurricane season rolled in, a crew of workers from Springfield, N.J.-based EIC Associates was working feverishly to reduce, if not completely eliminate, the possibility that future superstorms would repeat history by installing just over 3.5 mi. (5.6 km) of steel sheet pile wall along the beach for the New Jersey Department of Environmental Protection's (NJDEP) Bureau of Coastal Engineering. The keystone of the project was a pair of German-manufactured RTG Rammtechnik GmbH pile drivers rented from the Aldan, Pa., office of Equipment Corporation of America (ECA). The scope of this $23.5-million project â€” part of a much larger beachfill project by the United States Army Corps of Engineers (USACE) â€” entails driving the sheet piles and installing bent plate caps and geotextile anti-scour aprons. Project Manager Derek Serpe and Project Engineer John Caya are leading a team that works as if driven by a higher purpose. 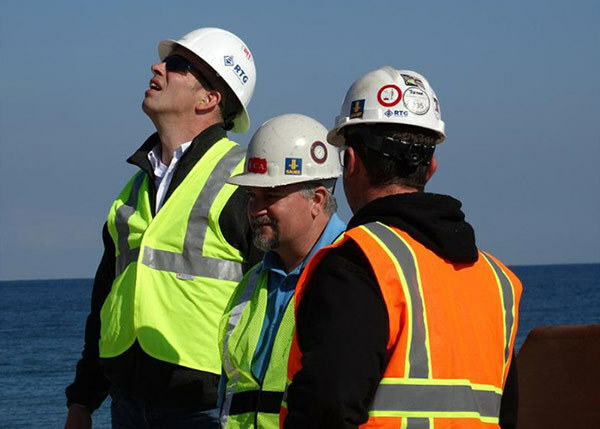 EIC, specializing in heavy and marine construction projects in New Jersey and New York, is no stranger to working under pressure on high-profile projects. One of only two bidders on a project to construct visitor docks at the Statue of Liberty, they faced liquidated damages of $10,000 a day and delivered the project ahead of schedule and under budget. The objective of this indomitable wall of steel is to protect a $265-million investment by the New Jersey Department of Transportation (NJDOT) in the 12.5-mi. (20 km) reconstruction of Route 35, initiated 10 years ago to address pavement distress and drainage issues along this coastal emergency evacuation route. The project was accelerated when Hurricane Sandy demolished the infrastructure. The wall also will exist to protect Mantoloking's residents, homes and commercial buildings. The equipment-intensive project hinges on two RTG pile drivers rented from ECA, a prominent distributor of specialized foundation construction machinery for heavy commercial, civil, mining and marine construction projects with East Coast and Canadian locations and a legacy dating back nearly 100 years. The RG 19 T and RG 21 T pile drivers with telescopic leaders fueled EIC's high level of production. Maintenance of the equipment, championed by ECA's Sales Engineer Chas Raysik and a highly skilled service department, also was critical since downtime was unacceptable on this deadline-sensitive, momentum-driven operation. It's apparent that this 10-year partnership remains intact based on personal service where the head of ECA's service department turns over a personal cell phone number to pile driver operator Rich Kaminski. The thickness of the interlock between the cold rolled steel beams required the fabrication of customized jaws for the RTG pile drivers, according to Raysik. RTG fabricated and shipped six sets of jaws from Germany to keep the project on track. The interlocks of cold-rolled sheets are looser than those of hot-rolled steel. EIC needed a jaw design that would match the driving rate of hot-rolled piles, while reducing strain on the RTG pile drivers. The extra play in the interlock also required close attention so the caps would fit properly. The sheer power of the RG 21 T pile driver can be felt as steel vibrates against steel high above. Sand particles rain down lightly and the beach flexes as the 45-ft. (13.7 m)-long steel pile seems to slide into sand with the ease of a candle pushed into a birthday cake. On this unseasonably warm day in November, the RG 21 T and supporting crew are moving steadily south immediately in front of mostly vacant multi-million-dollar summer homes. The ground crew threads the chain through the sheet pile and interlocks the clevis into the rear of the hammer's clamp housing. The RG 21 T almost instantly hoists the sheet into an upright 90-degree position and swings roughly 180 degrees to meet two workers positioned near the falsework in the sand. The sheet-pile is carefully guided into place before the vibration begins. Watching the crew advancing methodically down the coastline defines the old cliche “down to a science.” There is barely a moment of downtime between pile driving and hooking up the next pile. Four factors drive these five-man crews: the RG 19 T and RG 21 T pile drivers; a critical path schedule; reducing impact to the neighbors; and competition between crews. The presence of two crews created this friendly competition. As the RG 21 T team huddled for a quick lunch break, some friendly sparring ensued. “These rigs work in many environments,” Himborg said, competing with the reverberating sound of steel-on-steel. “This is a perfect job for a high-performance machine like ours because it's a long stretch of sheet pile wall and you can really maximize production.” The use of double sheets, he added, doubles production time. This $23.5-million project required $17 million in steel from Middletown, N.J.-based Skyline Steel, which mobilized a rotation of 15 truckloads from June 23 through Labor Day. From the clockwork-like handling of the sheets to the speed with which they enter the sand, it's clear that the RTG pile drivers with high-frequency vibration enabled this level of production. Raysik added that a suspended hammer relies on the weight of the hammer, whereas high-frequency vibration capitalizes on both downward force and vibration. Himborg seems to know the operation as well as his machinery as he rattles off specs. He said the RTG pile drivers feature an automatic self leveling function to ensure that sheets are plumb, which is mandatory on this project. A ground man with a hand level verifies plumbness as the pile vibrates into the sand. Steel I-beams pinned in the sand serve as falsework to ensure the plumbness of incoming piles. Serpe explained that keeping the sheets straight is critical to ensuring that the bent plate cap fits on top properly. “Most people that come out here and see a cold rolled sheet installed this straight want to go and shake the foreman's hand,” he said, indicating that this is rare. The work site, framed by a towering dune and stockpiled steel sheets, is not much wider than a couple bowling alley lanes. Just above the dune, a curious neighbor watches the pile-driving operation from his deck as the RG 21 T vibrates a sheet into the sand. The vibration, powdery consistency of the sand, and gravity constantly work to level the material, further narrowing the channel. A small fleet of excavators and bulldozers worked ahead of the pile driving operation to maintain the right-of-way. “In this area, you can't get any more of an easement or you'll be in someone's living room,” Serpe said. The wall was designed to follow the easement between the shoreline and the dunes, while adhering to residential property line setbacks, and tying into the future beachfill project. This required close coordination with the USACE and the NJDEP. Working on the beach presents unusual challenges, including wear and tear on the equipment. While gravity returns much of the fine white sand to the beach, it sticks to lubricated areas such as joints and within the tracks of the pile drivers. The resulting friction can be damaging, according to ECA's Raysik, who works to eliminate any downtime associated with the RTG pile drivers. The salty air also can increase corrosion. Another challenge is the constant clogging of air filters by airborne sand, which reduces the performance of the equipment. EIC's full-time maintenance crew fought this battle by blowing them out bi-weekly. Mobility was the next challenge since wheels and tracks slide in soft sand. EIC increased traction along the work corridor with a geotextile fabric base topped off with crushed stone. “It's an incredible amount of effort just to get the steel where you need to install it,” said Serpe of the sandy site. He attributes much of the credit to EIC's skilled operators. The steel sheets â€” 45-foot-long-by-4.9-foot (13.7 by 1.5 m) wide â€” tip the scales at 7,000 lbs. (3,175 kg). Each pile was dragged by a bulldozer from a nearby staging area to its final destination. The geotechnical aspect of this project is intriguing for anyone that has tried to drive a beach umbrella into soft sand. The surface layer is fine beach sand, below which is a layer of black sand, clay, and an additional layer of fine sand. Himborg explained the science as the operation unfolded. “It's all about friction,” he explained, indicating that the high water table is helpful. “When you come to a water-saturated area, it acts like a lubricant and facilitates the penetration process.” The steel sheets essentially displace the sand as they are driven. The RTG pile drivers feature an active push system, according to Himborg, which allows the machine to plow through dense materials such as clay. The sand on this project was obviously no match for the RTG's. While EIC occasionally encountered clay at the tip elevation, the pile drivers were met with little resistance. Drive time hovered between two and three minutes 95 percent of the time. He described the situation as “putting the brakes on the hammer” when the sheet breaks through the clay below and needs to be stopped by the rig. Serpe indicates that the power of the RTG's was the defining factor in punching through the heavy layer of clay beneath the beach. EIC will not only deliver protection to the barrier island of Mantoloking, but the finished project will restore the beach to its original appearance. This is the first phase of a $300-million USACE beachfill project that will build up dunes, a berm and extend the beach by 200 ft. (61 m) between the Manasquan and Barnegat Inlets. When all is said and done, Mantoloking will return to the bucolic island atmosphere that residents have traditionally enjoyed. But it will be stronger. This wall of steel will be a distant memory, disguised by dunes. “You're never going to see this wall,” said Serpe as waves crash gently nearby, “and it's the last line of defense, if God forbid, the big storm ever comes again.” It seems like a small price to pay.